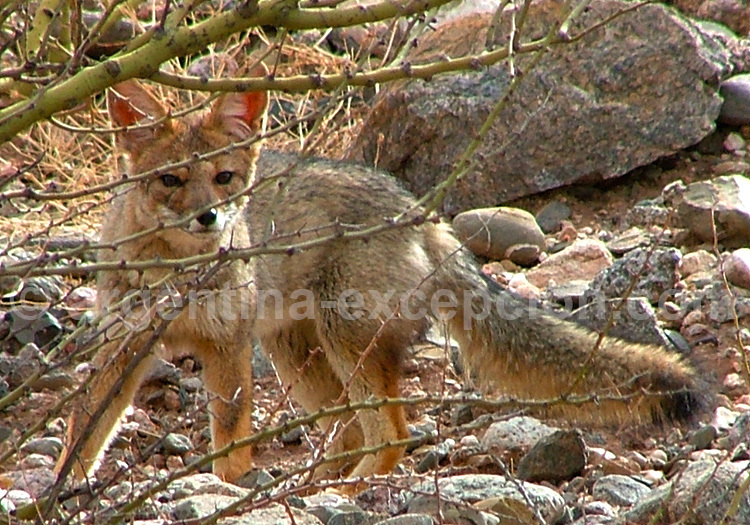 Touristic information about Talampaya National Park, by our local travel agency. 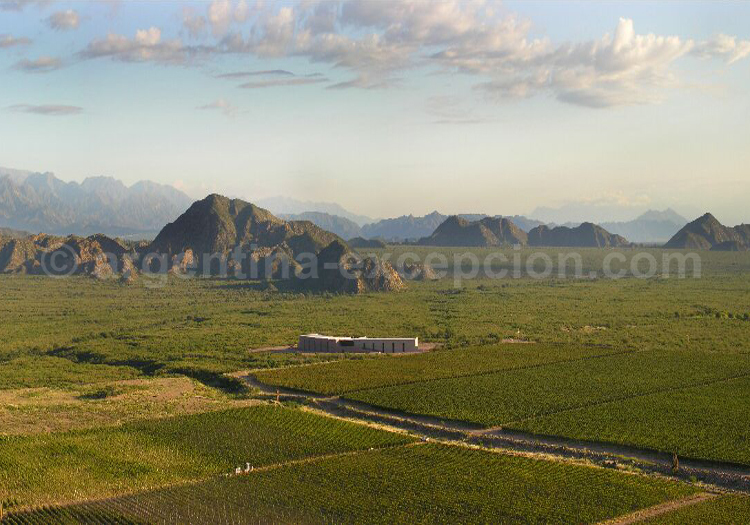 Talampaya is located in the province of La Rioja (130 miles south of the city). The nearest villages are Pagancillo (18 miles) and Villa Unión (37 miles). Incredible natural vestiges of life’s evolution on earth, the geological and paleontological park of Talampaya is lost in the middle of the desert. The 215,000-hectare Talampaya Provincial Park was created in 1975 and became a National Park in 1997 to protect its remarkable paleontological and archaeological fossil records. 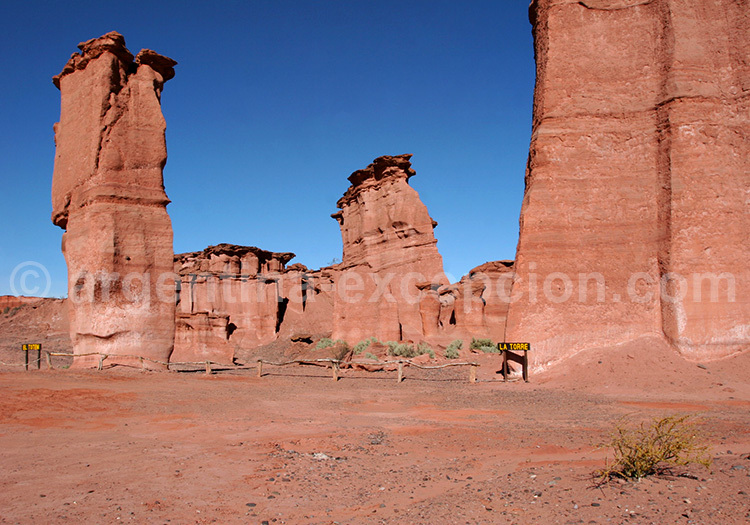 The park is declared World Heritage Sites in 2000 by the UNESCO considering that “No other place in the world has a fossil record comparable to that of Ischigualasto-Talampaya which reveals the evolution of vertebrate life and the nature of palaeoenvironments in the Triassic Period”. Its 215.000 hectares are the place of numerous fossils of dinosaurs. Weather : when to get to Talampaya National Park ? The temperatures are extreme, ranging from 15°F in winter to 122°F in summer. The sun radiation is very intense, the wind blows all year-long, and the rain is infrequent but torrential in the summer. Therefore, we highly recommend protecting yourself from the sun, bringing plenty of water when visiting the parks and if possible, avoiding the hottest period, between December and February. It is also advisable to visit the parks in the morning. Thanks to all the bones and fossils that were preserved by the extreme aridity of he region, Talampaya proves the presence of dinosaurs in the Triassic period (from 245 to 208 millions of years ago). About 225 millions of years ago, dinosaurs used to live in the region of Talampaya. The Herrerasaurus, a rapid predator, was first discovered there in 1960. The paleontologists have recently discovered new fossils dating from the Triassic Period (the period when the dinosaurs appeared). The most notable specimen was named Lagosuchustalampayensis! It dates back 250 billion years, is one of the first dinosaurs of the world. A little younger, the Palaeocheris talampayensis turtles are 210 million years old. There are hundreds of petroglyphs all over the place. 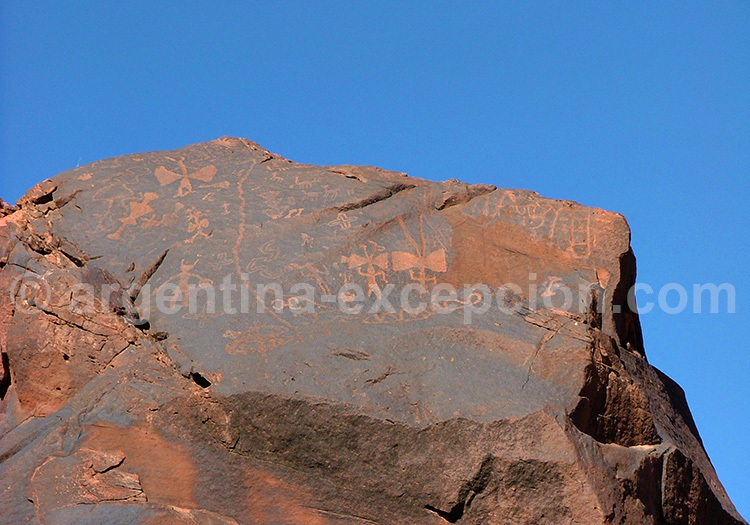 Some stones of the Park are covered by geometric forms, or drawings of animals. It shows a human presence there beetween 640 B.C and 1.180 AC. The Talampaya park is located in a very arid area, almost a desert region. The landscape is limited to a couple of shrubs, cacti, and minerals. Foxes and birds of prey hide in the cliffs. It also posible to get close to guanacos, mara and ñandous. What to see in Talampaya National Park ? Talampaya is a real open-air museum. On this extraordinary landscape of red cliffs and rocks, men have carved anthropomorphic, zoomorphic and abstract patterns, leaving mysterious rock painting that has become part of the cultural history. The region was inhabited between 640 BC and 1180 AC thanks to the natural shelter offered by the caves. The visit of the park starts at the 525-foot deep Talampaya canyon, where one can admire those petroglyphs in the areas of Puerta de Talampaya and Los Cajones. 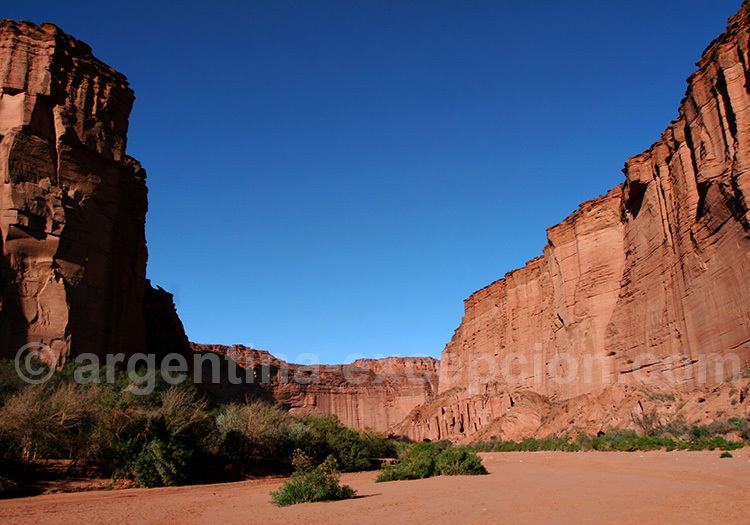 Created by the rio Talampaya, now disapeared, the canyon is high and impresive. Some geological formacions seem to copy the Three Kings, a Catedral, Balconies, a Chess game and a Priest. The park ranger will give you the authorization to go to Ciudad Perdida, a breathtaking panorama of strange rock formations. Hotels : where to stay near Talampaya National Park? Cañón de Talampaya Hotel : a comfortable building at the north of Villa Unión. Its plain design is adapted to the surronding landscape. Big windows and patios give a nice anoramic view to the colorful mountains. Naindo Park Hotel : this high-quality hotel has a restaurant, a casino, a swimming pool, a sauna and a spa and is located 124 miles away from both parks. 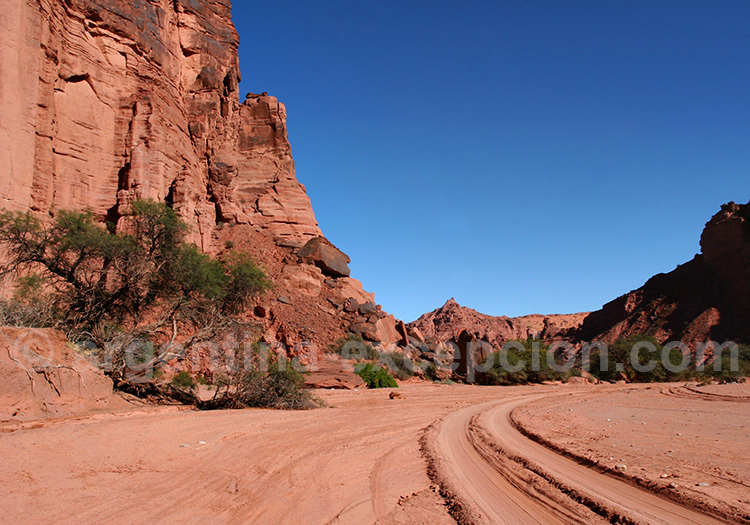 Transports : how to get to Talampaya National Park ? By air : San Juan and La Rioja. There is no regular public transportation to access the parks. Aerolíneas Argentinas has daily flights between La Rioja and Buenos Aires. 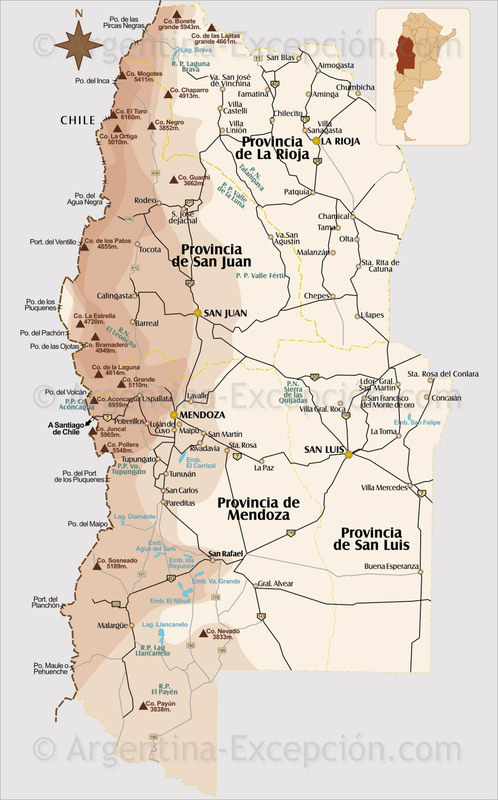 By bus : the provincial capital city of San Juan and La Rioja are very well connected to the rest of the country. To reach the two parks, we advise renting a car. 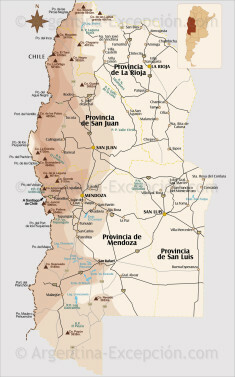 The best way is to go to Villa Unión, to take the national road 40 to North, and then take the provincial road 76 to East. It is forbidden to enter the park with a private car. Visits are organized to see the main sites (from 2,5 to 4,5 hours) and renting bikes is possible if escorted by a guide. 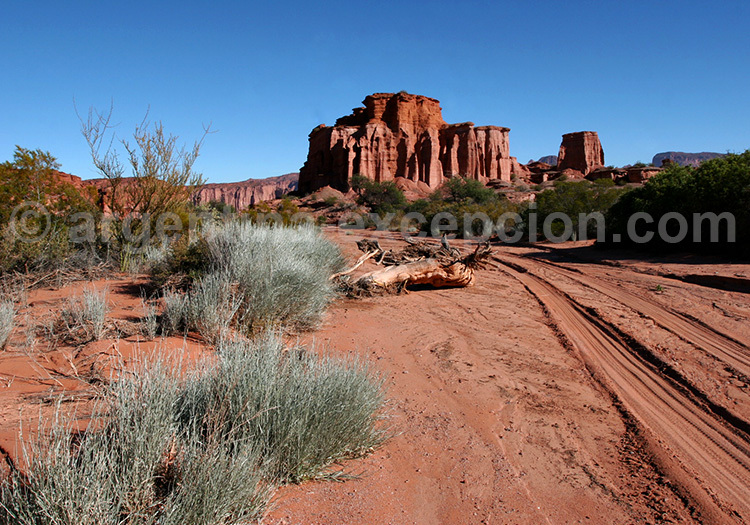 Ischigualasto Park is about 79 km south from Talampaya. 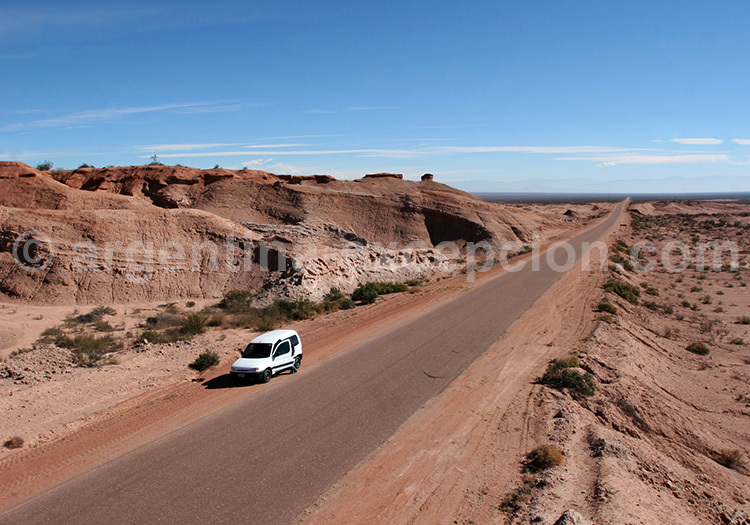 With its 63.000 hectares of geological formacions and arid landscape, it is often called Moon Valley. It is the place of many fossils of dinaosaurs from the Triassic. From Mendoza to the Moon Valley : 10 days around the Argentinean vineyards and the surreal landscapes of the Talampaya and Ischigualasto parks. Travel on the national Route 40, from Iguazu to Mendoza, from Salta to Ushuaïa: 38 days for the trip of a lifetime, to discover the most beautiful landscapes of Argentina and Patagonia. You will travel all the way down the mythical Argentine Route 40; 10,000 km from Northeast Argentina to the Puna, from the Wine Road to the Lakes and Glaciers of Patagonia, from Salta to Ushuaia.